The world is indeed a crazy place. I believe that the last few weeks in America have been irrefutable evidence of that. We are a society that needs to be able to find sanctuary in our home. It isn’t just a want, but an incalculable need to feel safe in this day and age. 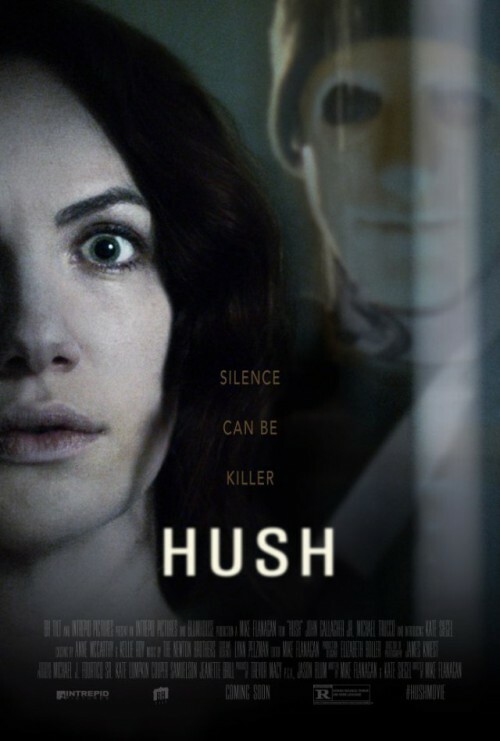 The latest home invasion thriller Hush by Mike Flanagan adds another layer of vulnerability by making the lead deaf. Katie Siegel stars as Maddie, a writer who has moved deep into the woods to write. Her life is solitary. There is nothing that the eye can see except for trees. She is writing her new book which has seven endings so far. She can’t seem to focus on anything fully. In the first scene she is trying to cook for herself, but she can’t focus enough to get the recipe right. She is then forced into a situation in which she has to focus when an unnamed attacker begins stalking about her house. These opening moments may feel throwaway, but Flanagan is purposefully staging every moment so that it can pay off later. Flanagan lingers on the shot of a hot pan of food silently until he abruptly adds the sound. He is unsubtly keying the audience into Maddie’s world. His heroine may be deaf, but Flanagan shows us early that she is resourceful. Films of this type traditionally drag out the suspense by keeping the attacker a secret to our lead character for much for the running time. Think of Halloween, The Strangers or House of the Devil. Those films set up a world and character dynamic over the course of at least half the film before letting the attacker run rampant. Hush kicks that funny business to the side and lets the attacker played by John Gallagher Jr. come full force by about ten or fifteen minutes into the film’s lean eighty minute run time. Just because the film is lean and tight doesn’t it is lacking in suspense. Quite the opposite. The effectiveness of the film comes from the unrelenting pace at which the movie moves. Once the attacker is known by Maddie, the movie moves in what is seemingly real time. Some of the most inventive moments come when Maddie starts to see her world as a narrative she can control. It is refreshing to see a character in this type of film think through the ramifications of each action. Maddie doesn’t make any decision for plot purposes. She is bright, resourceful and fully aware of her ability to outsmart the attacker. She may be smarter than the attacker, but that isn’t to say he is dumb. They each make mistakes and they each use their strengths to their advantage. He isn’t easily fooled, but neither is she. They are perfect foils for each other. The movie is a really effective gut punch. It isn’t going to be a film that I am dying to revisit this Halloween. It is smart, sleek and effective, but it lacks a true pulse to it. The setup is the story. The most simple-minded audience member can see that Maddie’s weaknesses will be her strengths by the end of the film. There is only one great way to watch this film and it is in the darkest hours of the night. You will probably start seeing little hallucinations of John Gallagher Jr.’s quietly unsettling mask. Or, even worse, you will probably start hearing the faintest hums in the night. That’s what makes this movie tick. The film’s conflict is very reminiscent of the very tense 1967 Audrey Hepburn thriller Wait Until Dark about a blind woman that is terrorized by three men in her New York apartment. Just like Hepburn in that film, Maddie has a very particular advantage that is congruently linked with her weakness. The world to Maddie can only be felt, it can’t be heard. Flanagan’s film crawls up your back like the tiny crack of a twig you hear in the emptiness of nighttime woods. Except the audience knows that only we can hear Maddie’s world. She has no sanctuary and so we the audience have no escape.